After our Worldview Weekend Rally in Rockford, Illinois on Sunday night November 21, 2010, we were informed that the church we had been renting for the past few years does not want us to return. What is really sad is this is the church in which my wife grew up and has included five generations of her family dating back to her great grandparents on both sides of her family. One set of great grandparents were two of the original 13 founders of this church. At the conclusion of our November 21, 2010, Rockford Worldview Weekend we were told that three months before the rally the church staff had voted for Worldview Weekend not to return in 2011 because our 2009 rally was thought by some of the church staff to be too negative and that it was inappropriate to name the names of false teachers. I asked what their senior pastor thought about that evening's Worldview Weekend Rally but was informed that the senior pastor had chosen not to attend the conference. Please understand that I am not going to name the church because those that attended the conference and live in the area know the church of which I speak. I am not writing this article because of some kind of personal offense but to highlight how Biblical truth has become an offense to most of America's churches. Many such churches would claim to love truth but what they really love is a man-centered Christianity that helps them obtain success in their marriage, finances, family, and a positive attitude that produces health and a successful personal life without the pain of dying to self, picking up the Cross of Christ and being persecuted for proclaiming Truth. "For the time will come when they will not endure sound doctrine; but after their own lusts shall they heap to themselves teachers, having itching ears." The 2009 speakers that joined me for the Worldview Weekend Rally in Rockford, Illinois included me, Dr. Erwin Lutzer and Dr. David Reagan. In my 2009 presentation I spoke on the topic of my book Grave Influence and I did name such Emergent Church, false teachers as Pastor Brian McLaren who has said the cross and hell is false advertising for God. I named Pastor Bill Hybels that signed the Yale document that states that Muslims and Christians worship the same God. Hybels has also had Brian McLaren at his church. I also mentioned Pastor Rick Warren who sits on the advisory board of the Tony Blair Faith Foundation that seeks to bring the religions of the world together. I also named Pastor Rob Bell who has proclaimed an abundance of heresy and who has also spoken at Bill Hybel's church. I spoke on why pagan spirituality was doubling in America every eighteen months and how many New Age practices had come into the churches of America such as "Christian" yoga and contemplative prayer. I explained how Christians could proclaim the Gospel to a postmodern culture that has become more interested in spirituality than theology. I also warned last year, as I did this year, that many churches are being compromised from within by church staff that do not adhere to the Biblical mandates and purposes of a New Testament church and are an inch deep and a mile wide in their doctrinal and theological understanding and commitment. I warned that the remnant should understand that our greatest opposition would not come from the government but from those that have the title "reverend" or "pastor" in front of their name. Click here to hear a few minutes of the presentation I presented at this church in 2009. In 2009, Dr. Lutzer spoke on seven lessons America should learn from Nazi Germany and Dr. Reagan spoke on 50 signs we are living in the last days. All three of us used a lot of scripture to equip those in attendance to understand the times and know what God would have them to respond. Worldview Weekend is thankful for the churches that will allow us to rent their buildings but the increasing trend is that we are being forced to rent more and more hotel ballrooms because so few churches have leaders, staff, and pastors that have clear discernment, real courage under fire, and an unwavering commitment to Biblical truth in an age of non-judgmentalism, tolerance, and Christian happy talk. No one ever said being a watchman on the wall that warns of impending danger was going to be a popular job, but if popularity is what we seek then we are not seeking to be faithful to the One we serve and thus we have failed in our calling. I am the good shepherd: the good shepherd giveth his life for the sheep. But he that is an hireling, and not the shepherd, whose own the sheep are not, seeth the wolf coming, and leaveth the sheep, and fleeth: and the wolf catcheth them, and scattereth the sheep. The hireling fleeth, because he is an hireling, and careth not for the sheep. Listen to this audio of Pastor John MacArthur as he explains how Jesus named the names of false teachers and how this is the job of all Biblically minded Christians and true shepherds. In this audio clip Pastor MacArthur calls out Rick Warren by name for teaching a false gospel. Worldview Weekend will not be deterred in speaking truth no matter how unpopular it becomes with individuals or members of a church staff. Needless to say, I was concerned how my wife would respond to this criticism since she was raised in this church. Her response revealed to me, once again, how blessed I am that God gave Melissa to me as a helpmate. Melissa's response was "why are you surprised, you knew this church was becoming increasingly liberal over the past few years. I was shocked they let Worldview Weekend return for the 2010 rally." Melissa encouraged me to shake the dust from my shoes and go out and find a hotel ballroom. She also encouraged me to continue to bring the Worldview Weekend to Rockford because of all the people, including life-long friends, that come up to her at the resource table to express their thankfulness that Worldview Weekend returns to Rockford, IL each year. …I attended a Worldview Weekend Rally at [name of church removed] on Sunday evening, November 22nd, and found it to be very helpful, informative, stimulating and timely." This father went on to recommend that his children read some of the books written by the speakers. At this point in time, all three books impress me as being coherent, credible, plausible, relevant, responsible, strategic and timely. I believe that they qualify as priority reading for serous Christian believers and church leaders who need and want to be alert to the crucial times in which we and our families are living." This letter reveals a common response and a common problem that I have seen all across America - lay leaders that are more Biblically grounded, discerning, and committed to Biblical truth than some of their own church staff. The Worldview Weekend in Rockford was held at another location a few years ago and has consistently had a large attendance regardless of where it is held. 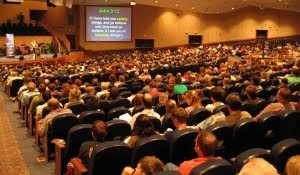 Thus, if you live in or near Rockford please know we will return and have already secured a hotel ballroom for the November 2011 Worldview Weekend Rally in Rockford, IL. Let me answer the question of our article. Is it negative and unbiblical to name false teachers? The Bible is filled with examples of Jesus and others naming false teachers by name. For example, the Apostle Paul in 2 Timothy names numerous people by name. In III John 9, John named Diotrephes. Jesus called out the false teachers in Matthew 23 and Luke 11. I truly believe that one reason why God allows false teachers is to provide believers with a test of whether they will be faithful in their Biblical mandate to expose false teachers and thus protect the sheep from the spiritual poison of wolves in sheep's clothing. "And have no fellowship with the unfruitful works of darkness, but rather expose them." If a shepherd/pastor will not point out the wolves that are among the sheep then this should be a clear warning to the flock that the shepherd/pastor does not have their best interest in mind. Such a hireling is not called of God but is simply involved in an occupation for personal gain as revealed in I Timothy 6:5. In addition, such non-shepherds are revealing that they are more interested in their reputation and being seen by the larger community as tolerant and non-judgmental as defined by the unsaved world. False teachers also give the sheep the opportunity to test the commitment of their shepherds/pastors. If the pastors/shepherds on your church staff fail this Biblical test then it is time for the leaders of the church to replace such hirelings with real shepherds. If this Biblical action is not taken, then it is time for you to find a new flock that has a shepherd that will alert the sheep to the spiritualy immature and even wolves in sheep's clothing that are on his own church staff. Show me a shepherd/pastor that will not name false teachers and I will show you a false teacher. From those words it is clear that God allows teachers of error for the same reason as He does persecutors of His people: to test their love, to try their fidelity, to show that their loyalty to him is such that they will not give ear unto His enemies. Error has always been more popular than the Truth, for it lets down the bars and fosters fleshly indulgence, but for that very reason it is obnoxious to the godly. The one who by grace can say "I have chosen the way of Truth" will be able to add "I have stuck unto Thy testimonies" (Psalm 119:30, 31), none being able to move him therefrom. "For there must be factions among you in order that those who are genuine among you may be recognized." (1 Corinthians 11:19). Committed Christians must publicly name false teachers because it is impossible to privately correct public false teaching. This fall I received an e-mail from a young lady that is a junior in high school near Atlanta, Georgia. In her e-mail she stated that because she had attended two Worldview Weekend Rallies in Atlanta and heard me expose the false teaching of emergent Pastor Rob Bell, she had been equipped to reject his false teaching when a Bible study group at her Christian school decided to read one of his books. She informed me that she immediately recognized the name of Rob Bell and remembered what I had spoken. This young lady had the courage and conviction to politely hand the book back to the group and to warn them of Bell's false teaching. This young ladies testimony has come to my mind many times this fall and has been a real source of encouragement to me to continue to speak truth no matter how negative or offensive it may be to the non-discerning. If I had not named the name of Rob Bell, how would this student had known to reject his book and false doctrine? If I had not named the name of Rob Bell would this student now be spiritually deceived? If I had not named Rob Bell by name would she have been able to warn her peers to this spiritual poison? The late Pastor Vance Havner wrote, "We live what we believe; the rest is religious talk." Living what we believe includes our willingness to name the name of false teachers and to endure the criticism and persecution that will surely follow. To do any less would be treason to our calling, to our mandate, to our Lord and Savior Jesus Christ. When we expose false teaching and false teachers we are proclaiming and defending the authority, accuracy, and application of God's Word; the very thing that false teachers seek to undermine. Living what we believe requires speaking Biblical truth and Biblical warnings no matter how negative or offensive it may be to the spiritually immature, non-discerning or wolves that crept in among the sheep. Jude 3:1-4 commands all believers to contend for the faith that is under attack from false teachers. Beloved, when I gave all diligence to write unto you of the common salvation, it was needful for me to write unto you, and exhort you that ye should earnestly contend for the faith which was once delivered unto the saints. For there are certain men crept in unawares, who were before of old ordained to this condemnation, ungodly men, turning the grace of our God into lasciviousness, and denying the only Lord God, and our Lord Jesus Christ. Truth is never negative to those who seek to serve The Truth.